Are you a mad keen quizzer, do you find that you're always winning that gallon of ale in the weekly pub quiz, and do you fancy putting your knowledge to test to try and prove that you're one of the best in the district? Well if you've got that problem, and if you can find them, you can join the Five Quiz League and maybe even become an 'A' team. The FTQL is a league game format for teams of four players, but bearing that in mind, what you realistically need is a squad, a squad of regularly available quiz players. We tend to believe that the optimum number is around six or maybe seven. If you can satisfy those basic criteria that are needed to fulfil all your games, then all you need to do then is contact the League Secretary in around October time, and you can join! The family of the Five Towns Quiz League...You can join 'em, and you might be able to beat 'em! 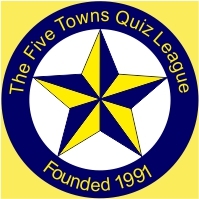 What you need to join the Five Towns Quiz League as a competing team is simply to contact the League Secretary, or for that matter any of the current Committee members of the FTQL structure and basically, just tell us! If you're a mad keen quiz buff, but you've never been or been in an organised league team then what you need to know is that for the FTQL, matches are on Monday nights during the winter at 8.30pm, generally starting around the middle of October, running to around some time in May. Monday night league matches last around an hour and a quarter to an hour and three-quarters and we have two league divisions, which for the 2016-17 season will be 7 teams each division. We play for several different competitions over the winter months and these are the Division One Championship, Division Two Championship, The Knockout Cup, the Plate Knockout and the Handicap Cup. There is also an individual scores competition, which is based on scores taken from the individual rounds in league matches. The League Secretary can be contacted on 07539 073320, and other committee members can be contacted on the numbers given in the "Committee" page of this website. Well what can we say - benefits of joining the Five Towns Quiz League...well the obvious one is that you get to pander to your ego regarding your own general knowledge, once a week and in the presence of at least eight or nine other people. The second is that you get a fun night out, get to visit pubs and clubs that you possibly haven't been in before and possibly wouldn't have ever considering visiting. The final and most important thing is that you get to make lots of new friends and can count yourself as part of the family of the Five Towns Quiz League...founded in 1991 and still bloody going!